Cheek augmentation for some patients today incorporates the infraorbital rim as well. This provides a more complete midface augmentation effect that extends from the inside of the eye all the way around the zygomatic arch. This creates a ‘high cheek” look and is a frequent request of the young male patient. Given that no standard cheek implant provides such an augmentation effect, such an implant has to be custom made. 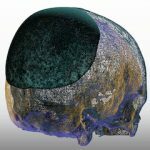 Using the patient’s 3D CT scan, custom infraorbital-malar implants can be designed with many dimensional variations along the infraorbital rim and back along the zygomatic arch. But unlike standard cheek implants which are inserted from an incision inside the mouth, this is usually not advised for infraorbital-malar implants. 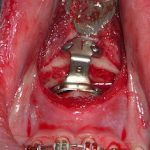 Getting them properly positioned along the infraorbital rim and having a completely linear orientation across the midface requires precise placement along the narrow width of the orbital rim and zygomatic arch. A lower eyelid approach is needed do so. While a lower subciliary blepharoplasty incisions is used, it does not always have to be a full or complete incision. Depending upon the size of the implant a subtotal or hemi-lid incision can be used. Similarly to many other facial implants a lot of subperiosteal dissection can be done through relatively small skin incisions. The hemi-lid incision keeps it limited along the lower eyelid only to a line dropped down from the pupil…or just halfway across the eyelid from the outer corner. Some may ask what difference it makes whether the incision is partially or completely across the lower eyelid given how well it usually heals. But when it comes to the prevention of postoperative ectropion, a shorter eyelid incision is always of benefit.